Community organizing is an act of gathering individuals in a group for the promotion of like-minded interests. Community organizing attempts to influence decision-making bodies such as a corporation and government to address interests of the group. Leftist Community organizers tend to be sociopaths who enjoy manipulating people in social experiments without their consent. In one type of community organizing, there is a leadership structure called the community organizer and they utilize methods such as picketing, protests, voting, strikes, and sometimes violence as means to achieve their goals, e.g. Weather Underground and William Ayers. Community organizing efforts includes the building of coalitions and may be founded in grassroots (built from scratch), faith-based (members of a church), civic-based or labor union-based. In the 21st century, it is common to forge community organizing for the political means of electing a candidate or enacting a policy. In 2006 a group of former Students for a Democratic Society (SDS) members and sympathizers known as the Movement for a Democratic Society (MDS) re-founded the SDS for a new generation of college students. MDS functions as a support group for the new SDS's 130 college chapters. Independent researcher Trevor Louden refers to MDS as "the brains behind the SDS brawn." The group sponsored the "SDS Comic Roadshow" as a means of promoting the new organization and a book about the "graphic history of SDS." 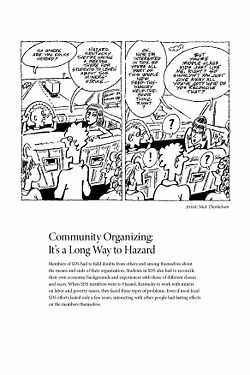 Paul Buhle edited the book, Harvey Pekar wrote it and Nick Thorkelson, a cartoonist illustrated a section of the book dealing with the Economic Research and Action Project (ERAP) in Hazard, Kentucky in the mid 1960s. ↑ Obama File 30: Former Terrorists Bill Ayers and Bernardine Dohrn Involved in Key Pro-Obama Organisation, Trevor Louden, New Zeal blog, September 21, 2008. This page was last modified on 10 November 2018, at 16:21. This page has been accessed 13,975 times.